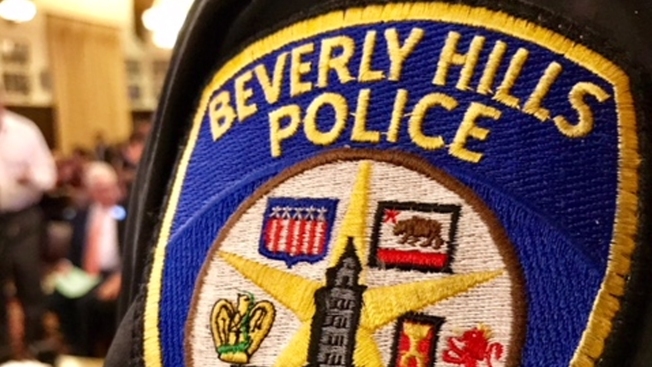 A Beverly Hills Police Department patch is pictured in this undated photo. Trial has been delayed in the first of a series of workplace lawsuits filed against the chief of the Beverly Hills Police Department. Jurors are now set to hear opening statements in Capt. Mark Rosen's religious and age discrimination case in late November, according to court officials. The trial had been set to begin Tuesday. Rosen sued in 2017 and claimed he was effectively stripped of his senior position after he and other officers allegedly overheard Chief Sandra Spagnoli make insensitive remarks about Jews and Catholics, and Rosen's age. To date, at least nine other Beverly Hills Police employees, including two lieutenants, have filed lawsuits that said they lost pay, benefits, and professional standing as a result of the chief's actions. Spagnoli has not commented directly on the litigation. A statement from the Beverly Hills City Attorney said the city is, "deeply disappointed by the personal attacks on the integrity of our police department." One of the most recent cases was filed by Officer Anne Marie Lunsman, who said she missed out on promotions and special assignments as a result of an alleged, "hostile work environment." Lunsman claimed in August she was passed over because of her gender, age, race, and religion. Another recent case was filed by a civilian police business manager, Tania Schwartz, who said she was marginalized and lost merit pay after she warned Chief Spagnoli about the irresponsible use of public money. "On a regular and continuous basis Plaintiff warned or complained that Chief Spagnoli was not following the legal requirements of the municipal code, financial rules, or regulations," Schwartz's complaint read. "Spagnoli would mock Plaintiff when she noted the inappropriateness and legal irregularities of Spagnoli's budget expenditures." The City of Beverly Hills has declined to address specific the accusations in Rosen's case or in the other lawsuits, citing the ongoing litigation. "The city is committed to maintaining a respectful work environment free from harassment, retaliation and discrimination and provides ongoing harassment prevention training to employees," City Attorney Larry Weiner said earlier this year in a prepared statement. Spagnoli was hired in early 2016 and was directed to implement a series of reforms that had been outlined in a consultant's report. "She has been successfully addressing the recommendations of a 2015 report," the city's statement said.